I’ve been playing Kirby games since the beginning, literally; Kirby’s Dream Land is my jam. After approximately seven hours, I have completed the latest title in the series which is now available for the Nintendo Switch. If you like Kirby, Kirby Star Allies does not disappoint. Featuring the same pink puffball we all know and love, the story is just a touch dark for those old enough to understand but simplified and cutesy enough for all ages. You start your journey reclaiming your friends from the influence of the dark Jamba Hearts. Before you ask, no, these hearts are not the result of consuming too much Jamba Juice. While performing a dark ritual to bring forth an ancient evil, something went wrong and the Jamba Hearts were scattered, leading many to land on Kirby’s home planet. During your travels to help those who have been infected by this evil, and prevent it from rising again, you can make friends! In the opening scene, Kirby is exposed to one of these Jamba Hearts. Instead of turning him evil, it bestows upon him the ability to “make friends” with characters he would otherwise have had to battle. 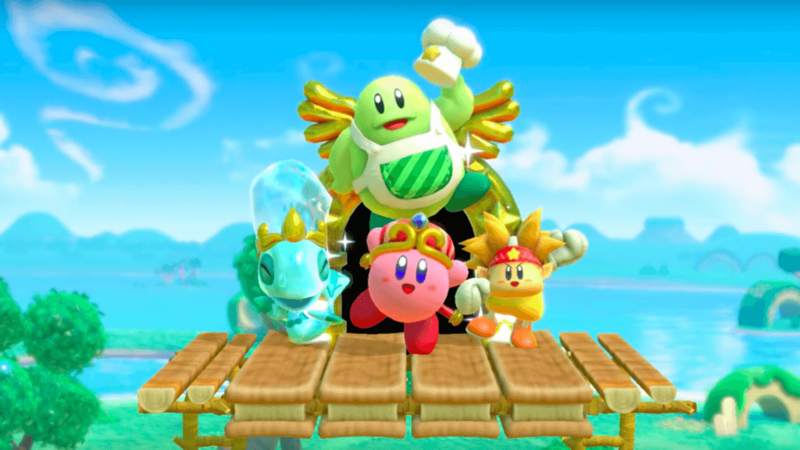 Kirby can influence up to three characters at a time to be his friends and fight alongside him on his journey. Each friend brings with them an ability that will help you along the way. Of the twenty-three abilities Kirby can gain from his “allies” we see four which are new and unique to this game: Artist, Festival, Spider and Staff. You also have the option of “augmenting” abilities, which happens when you combine the powers of two friends. Example: Blade Knight (sword) + Burning Leo (fire) = Sizzle Sword. You can also perform “Friend Actions” are key throughout the game, especially during the boss fight. Speaking of the boss fight/story wrap up, here’s where the dark part of the tale comes back into play. Without giving too much away for those who plan to play Kirby Star Allies, a lot happens pretty fast: multiple battles, some dark rituals, and a little bit of (human?) sacrifice for good measure. For our younger gamers, most of these themes will sail cleanly overhead; for those of us who are currently only children at heart it’s just a tad darker than you’d expect from an adorable little Kirby title. As far as game ambiance goes, something I did notice and greatly appreciate in Kirby Star Allies was the number of call-backs to previous games. From music to imagery and even the character design in the final boss, this game does an excellent job of connecting itself to previous titles. I loved the soundtrack and frequently found myself bobbing along to new iterations of familiar Kirby tunes. Music can go a long way towards influencing the mood of each level; you can feel the urgency in trickier levels with a darker, more fast-paced song. Likewise, you get the easygoing feel of a cake-walk level in a boppy, upbeat tune. I appreciate the ambiance that can be created with that attention to detail. Now, once you have beaten the Story mode in Kirby Star Allies, two other modes pop up, namely Guest Star: Star Allies Go and The Ultimate Choice. In Star Allies Go, you get to play as one of the twenty-three characters you can encounter in the game with either CPUs or up to three friends. You then go through levels trying to obtain power-up hearts that are hidden throughout for Attack, Health, and Speed. The goal is to use these power-ups to get through the levels as quickly as possible. In The Ultimate Choice, you battle only bosses, all bosses all the time, and you get to pick the difficulty level of these encounters. You start off picking what ability Kirby will have and the friends who’ll be joining him. Initially there are five difficulty levels available, with three additional levels appearing when you complete Star Allies Go. Up to three friends can join you in this mode as well. I did take a gander at both of these modes and I must admit, they are fun little additions to this title. There was just one element of this game that I did not necessarily appreciate; the very useful ability to share health-replenishing items with your friends. In Kirby Star Allies, eating food that is found throughout the levels can help you regain some health. Once you have consumed this food, you may share it with your friends so that they also benefit from the healing properties of a hotdog. In the game, this is done by walking towards your allies, and represented by what appears to be a kissing animation where a little heart pops up overhead. Cute, right? Downright adorable, some might say. Personally, I find it freakin’ disgusting. Unless Kirby has healing kisses, which is not a fact I was able to find anywhere, he is “sharing” these found food items with his friends via the baby bird method. That’s right folks, Kirby is premasticating this food and spitting it into his friend’s mouths. Now, I hear you saying, “But, Nikki, maybe it’s the power of friendship! Maybe Kirby really does possess lips of healing!”. But nay friends, nay. The in-game text says, “To restore a teammate’s stamina, pick up a healing item and FEED it to your teammate.” This, of course, conveniently fails to mention that you have already consumed this item. So, there you have it… ick. I’m no germaphobe, but I’ll pick up my own floor-burgers, thanks. I don’t think this would have bothered me so much if it wasn’t a fairly vital function of the gameplay. Come on, Nintendo, let’s turn that gross-meter down just a bit. You couldn’t spring for a “hands food to friend” animation? Overall, the gameplay is exactly what you’d expect from Kirby. It’s a side-scroller with a few puzzle elements to keep things interesting. The story isn’t overly cerebral, but I don’t honestly expect it to be; that’s not why I play Kirby games. There are hidden rooms to find and auxiliary levels to be explored. I honestly did not find or explore them all during this first playthrough, but I fully intend to go back and do just that. Kirby titles are my relaxing links to childhood. I play them to have fun and enjoy cute animation and a sense of satisfaction that comes from solving puzzles, no matter how minor or simplistic. This is a feel-good game folks. If you want action-packed gameplay or tear-jerking stories, this is not the platformer for you. If you want to relax, have a good time, and get in touch with your inner-child; Kirby Star Allies will gladly share its snack with you. Just make sure you’re clear on the mode of delivery ahead of time. Yeesh. If you want action-packed gameplay or tear-jerking stories, this is not the platformer for you. If you want to relax, have a good time, and get in touch with your inner-child; Kirby Star Allies will gladly share its snack with you.